has been one of the top rated trekking routes recently. The trekking route has lots of villages with stone houses, deep valleys, dense forests, high Himalayas, smiling people and beautiful old monasteries. 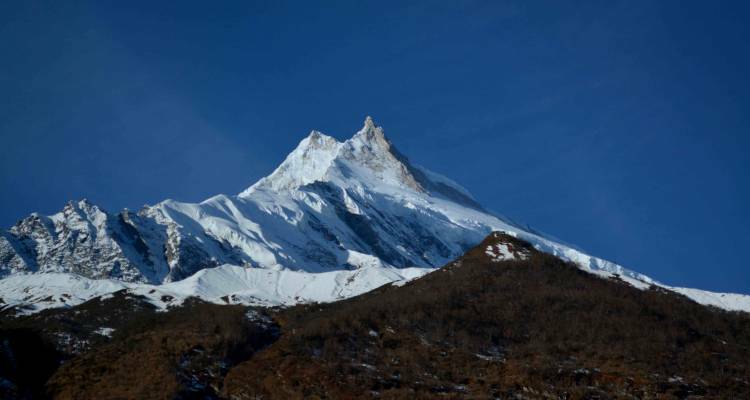 Manaslu circuit trek is named from the mountain called Manaslu, it is the 8th highest peak in the world. The trek lies on the north of central and mid western region of Nepal. The area is a remote and has undisturbed culture and natural vegetation. Manaslu circuit trek is one of the very less trekked place in Nepal though the popularity of the place is growing every day. During October and November the vegetation in here are very colorful and the weather is very clear, so is the best time to trek. April and May are also good season for trekking when the area has rhododendron blooming. 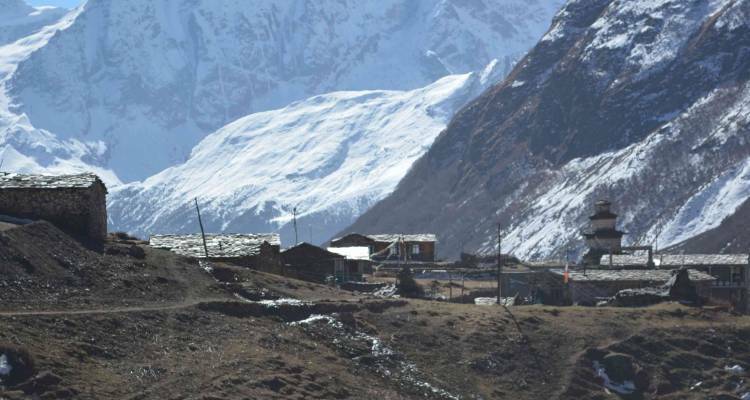 An option of combining the Manaslu circuit trek with Tsum valley trek for long trek can also be done. The tsum valley is even remote. Joining both treks, you will enjoy the culture and the nature of two Valley’s. Devo Adventure has been running and organizing the trek for the best experience and has kept it on the top list for the trip. 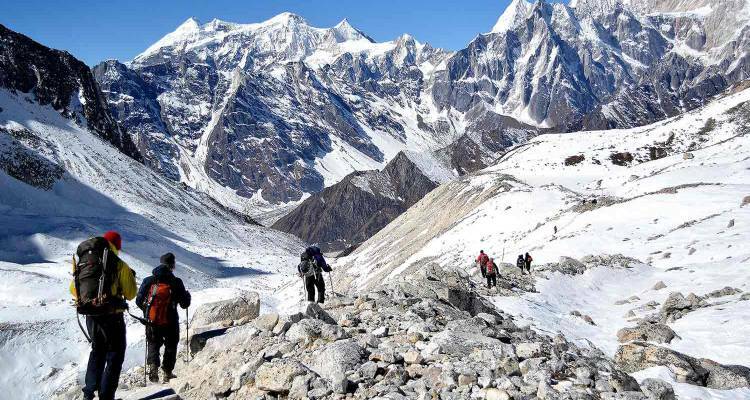 Trek next to the world’s eighth highest mountain Manaslu (8156m). Trekking to Larkya-La Pass (5130m) between two peaks Larkya (6219m) and Cheo Himal (6820m). Visiting world heritage sights, Tibetan cultural introduction. View of other high Mountains like Himalchuli (7893m), Nagdi Chuli (7879m), Annapurna Second (7937m). Trekking in the remote part of Nepal. Total trip days: 15 days, 2 two days drive. Walking hours: 6 hours on average. 7- 8 hours on some days. Trekking difficulty: 4 out of 5. Highest point of the trek: 5140 meters/ 16860 feet. People in the trek: Chhetry, Gurung and Tibet descended. Day 01: Kathmandu to Soti Khola (710m), Drive 8-9 hours, lodges. Day 02: Soti Khola to Machha Khola (900m), 5-6 hours, 200m uphill, lodges. Day 03: Machha khola to jagat (1410m), 6-7 hours, 540m uphill, lodge. Day 05: Deng to Ghap (2000m), 4-5 hours, 430m uphill, 110m downhill, lodge. Day 06: Ghap to Lho (3180m), 6-7 hours, 1210m uphill 280m downhill, lodge. Day 07: Lho to Samagaun (3520m), 4-5 hours, 550m uphill, 220m downhill, lodge. Day 08: Samagaun Acclimatization Day. Day 09: Samagaun to Samdo (3850m), 3hours, 330 uphill, lodge. Day 10: Samdo To Dharmasala (4460m), 4-5 hours, 610m uphill, lodge. Day 11: Dharmasala to Larkya-La Pass (5130m) then to Bhimthang (3730m), 8-9 hours, 670m uphill, 1400m downhill, lodge. Day 12: Bhimthang to Gowa (2515m), 5-6 hours, 1370 downhill, 180m uphill. Day 13: Gowa to Tal (1700m), 5-6 hours, 700 m descend, lodge. Day 14: Tal to Jagat/ (1300m/1100m) then to Beshishar by Local Jeep, 3-4 hours, ascends 110m, descend 400/600m, and lodge. Day 15: Beshishar to Kathmandu Drive for 6-7 hours. 01: Transportation by local bus from Kathmandu to Arughat and Jagat to Kathmandu, Private Jeeps are available on client’s interest. 02: Guide and porter for the trek. 03: Sightseeing entrance fees for mentioned places. 04: Meals for guests during trekking days (Breakfast, Lunch, Dinner). 05: Annapurna and Manaslu conversation permit, TIMS card for trek. 06: Manaslu restricted area permit. 07: Insurance, Transportation, Wages, Equipment’s and all meals & Lodges for the trekking staff. 08: First Aid Kid Box (for Normal Treatment only). 09: Government taxes & Other Applicable Fees. 01:Accommodations in twin bed on BB plan basis in Kathmandu for 4 nights. 02: Tea house lodge during trekking days. 03: KTM International airport arrival & departure transfer. 04: Travel & Health Insurance- Emergency Helicopter Rescue Insurance. 05: Lunch & dinner in Kathmandu. 06: Extra accommodation in Kathmandu in case of early return. 07: Tips for trekking staff. 08: Any kind of drinks, phone calls, laundry service, hot shower, battery charges and WiFi. 09: Unforeseen cost such as flight cancellation or delayed cost due to bad weather. Our representative will be in airport to receive you, briefing about the activities during your stay in Nepal. Hotel If you arrive early we will make permit the same day. Which will save us a day. Day 02: Kathmandu to Soti Khola (710m), Drive 8-9 hours, lodges. Permit making day then drive to Soti Khola. The drive passes through the beautiful villages and you will also see the Manaslu ranges from the road. The lunch will be in a local restaurant highway. The last stop will be in Soti Khola, a small village area that will be our starting point of the trek. Our final destination for the day is Soti Khola: after you can walk around the river, take a bath and watch the Langur monkeys, who are the frequent visitor. Day 03: Soti Khola to Machha Khola (900m), 5-6 hours, 200m uphill, lodges. The first day of the trek is easy and flat. Walking next to the major and a bluish river Budi Gandaki the trail is picturesque. The people in here are more of Aryan type and most of their houses are colored with red mud. The trail passes by the forests and beautiful villages waterfall and a small hot springs settled in the slope of the hills. We will have some climb to do on this day. 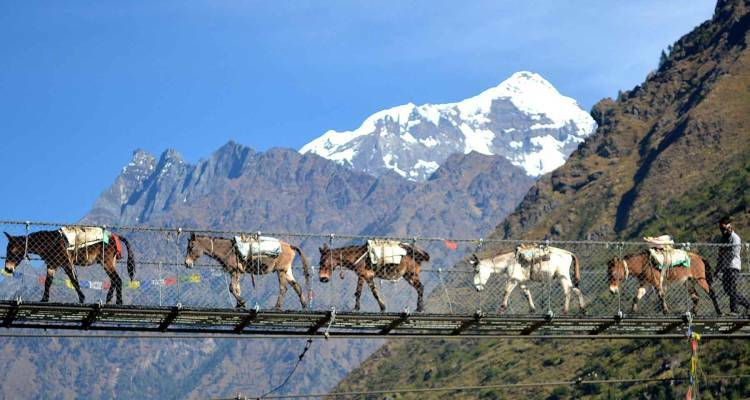 We will also pass the suspension bridges; which are the most import infrastructure built in the Himalayas. Machha Khola is a main place where locals also do fishing. Day 04: Machha khola to jagat (1410m), 6-7 hours, 540m uphill, lodge. The second day of the trail also follows the Budi Gandaki. The valley is narrower and the walk is another beautiful day walking just next to the river. The day is long and tough. Jagat is the place where our special permits are checked and then we are allowed to trek in there. As we get close there are few straight climbs that we have to do and as we get to the top of the climb the valley widens. From Punngpu the climb we cross again few suspensions bridges and get to Jagat. Day 05: Jagat to Pewa/Deng (1810m). Now we have entered the restricted area. The trail gradually climbs to Sridibas and after crossing a long bridge we come to place called Philim. Philim is the head quarter for villages around that area, with government offices and school. The people now look very different to the Aryan from below. They are more Tibetan looking people who are Buddhist. From Philim we continue to Chumjet for our lunch. Day 06: Pewa/ Deng to Namrung (2600m), 7-8 hours, 1030m uphill, 110m downhill, lodge. From Deng we start our beautiful walk to lower Bhee. The Upper Bhee is 1 hour away from the Lower place. The upper village is larger, with more houses, monastery and government services. From Bhee we will go to Ghap for Lunch. After Ghap we trek to Namrung through the dense forest of pine and walnut. Day 07: Namrung to Samagaun (3520m), 6-7 hours, 1210m uphill 280m downhill, lodge. The Number valley known as valley of the north gets much more stunning as we go up. Once we get closer to Lho we will see the worlds 8th highest mountain just behind the monastery. After crossing the Lho the landscape changes to semi moraine area on the western side. The view of 360 follows all the way to Samagaun. Day 08: Samagaun Acclimatization Day. 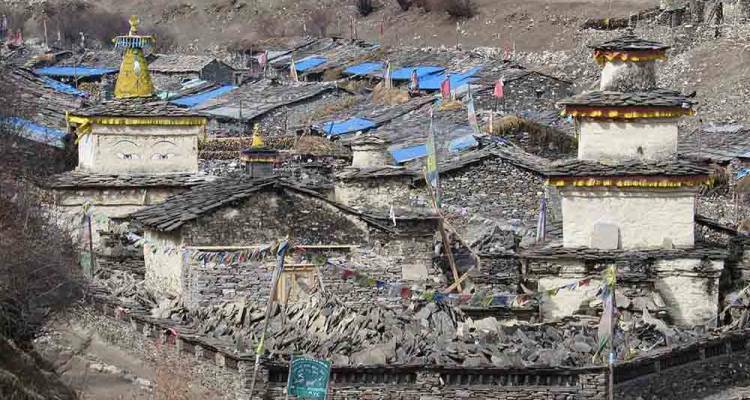 Samasaun is an old village where people are mostly the Tibetan descendant and the culture is very similar to Tibetan. 900 old monasteries and great scenery make this place an Ideal place where people can spend day's just observing people, and the Himalayas. We will climb the Manaslu base camp and come back to Samagaun, which will be 8 hours work. A close-up view of glacier and the valley from the height is mesmerizing. Samdo is just 3 hours away from Sama gaun and the trail is fairly easy. The landscape changes to sub alpine vegetation. Samdo was a market place for Tibetans, Nepalese and Indians. Tibet border just a day away from Samdo. A small hike after lunch in Samdo is better for acclimatization. Day 10: Samdo To Dharmasala (4460 m), 4-5 hours, 610m uphill, lodge. As we go up from Samdo to Dharmashala, the view of Himalayas and glacier are amazing. It takes 4 hours to get to Dharmashala. Dharmashala is just a place to stay for a night before crossing over the Larke La Pass. The view of Milky Way from Samagau, Samdo are worth to check out at night. Day 11: Dharmasala to Larkya-La Pass (5130 m) then to Bhimthang (3730m), 8-9 hours, 670m uphill, 1400m downhill, lodge. The climb is slow but beautiful and tough as the air is thin. It takes around 4 hours to get to the to top of the pass. On the top of the pass is you will see the Prayer flags. Once you are on the top of the pass at 5130 meters, the Himalayan peaks all around you will greet you. After the pass we go down all the way to Bhimgthang. On the way three glaciers can be seen joining and forming Ponkar Lake. From here on wards most of the trail is mostly going down though there are still climbs. On the left side you will see the west side of Manaslu. The trail passes through dense pine and rhododendron forest. Gowa is in the mid of the valley and the lodges are new in here, as the tourism has picked in few years. Day 13: Gowa to Tal (1700m), 5-6 hours, 700m descend, lodge. From Gowa we still travel through the forests and come to the old village called Tilje mostly built by rock and wood. From here we cross 3 suspense bridges walk for 1:30 for lunch in Dharapani, which has the jeep facility. From here it takes 2:30 hours to hours to Tal (lake). Tal where the village is settled is believed to be a lake before the water drained out. Day 14: Tal to Jagat/ (1300m/1100m) then to Beshishar by Local Jeep, 3-4 hours, ascend 110m, descend 400/600m. From Tal we have some climbs and down hill to go before we get to Jagat and from Jagat to Beshishar we drive by jeep. Day 15: Beshishar to Kathmandu Drive for 5-6 hours. Hotel in Kathmandu. 28 Do I need vaccination before arriving Nepal? Full fingers woolen gloves and extra pair of thin glove. 29: When you book any adventure and holiday trip with us we assume that you have read the full detail of booking term and conditions mentioned in our website and you are full aware of it and you have agreed with the agreement.